My postman must be wondering what is going on. Why do I keep receiving parcels from Australia? Have I started importing opals or baby koala bears? We haven’t enlightened him yet, but I think he would be just as bewildered to discover that the packages contain crochet squares as if I told him either of the other things. Crochet is certainly not recorded as a major commodity exported from Australia, although wool is, so perhaps I could tell the postman that! Anyway, this morning two Australian packages arrived. Having just discovered that the car had a flat tyre as Mr Snail-of-happiness was about to set off on a long journey, the delivery did rather cheer the morning up. Interestingly, the contents were somewhat complementary: one to do with the flora and one to do with the fauna of Australia. The first package I opened contained a square from Katrina over at Crochet Crush. 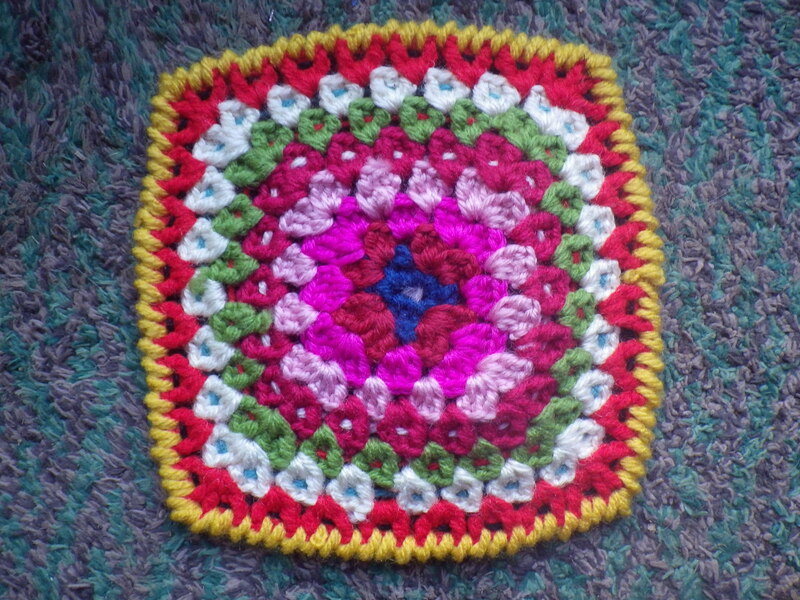 She is a relatively new crocheter, but you really wouldn’t know it from her beautiful square. She chose to use the colours of the State flowers of Australia to make her square. I can’t resist telling you what all of them are, as I do so love plants… I might even find pictures of all of them to put in my scrap book. and the border is yellow to represent to Wattle – the floral emblem of Australia. Isn’t that great? I now want to find out who ‘Sturt’ was… and see pictures of all the flowers. Amazing. I only have one book specifically about the Australian flora (Georgiana Leake’s Wildflower Album: Western Australia’s first botanical artist) and none of them are in there, so an internet search is in order. Thank you so much Katrina for all the thought and effort that went into this square. A catty square, plus a strawberry and a cupcake! But that was not the end of it… the second package came from Sharon of Gentle Stitches. Now I had already had a sneak preview of this square, because Sharon wrote a post about it before she sent it off, but actually holding it is really special … as is the case with all these works of art that are arriving. 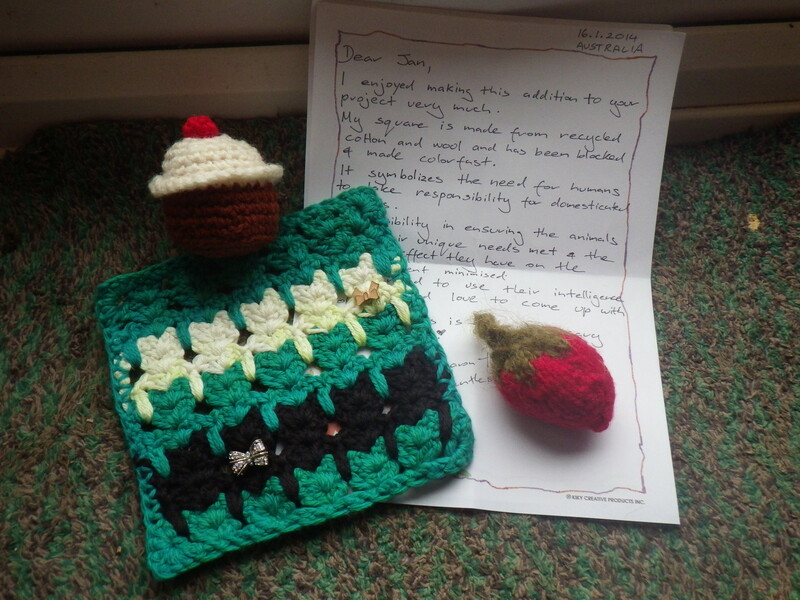 This package, however, also contained two bonus items – a knitted strawberry and a crochet cupcake… genuine aussiegurumi! Sharon’s square is amazing – representing the conflict between pets and native wildlife in Australia… something very close to my heart as an ecologist and animal-lover. The design is just fabulous… I keep looking at it in wonder. Many thanks, Sharon, for this beautiful square, not to mention the strawberry and the cupcake. Both squares complete with their text are also on the Masterpiece page, along with my latest creations and all the rest… it’s getting rather big now, but there’s plenty room for more if you want to contribute. Fantastic additions for you. I feel really good knowing how nice the world is.I’m sorry to hear about the flat tyre, what a pain to find just before a journey. Yes, it is great to have evidence of the lovely people in the world rather than the mean minority we see all the time on the news. Car is sorted – damaged wheel rim that could be repaired with sealant, fortunately. Mr S-o-h is now on his way to Hoddesdon via Devizes… exotic places! Nice to see that Downunder is well represented! be sure to check out Crochet Crush too! There’s also an Australian landscape square (http://wp.me/p2mlPL-GW) but any more Australian ones will depend on what arrives… I’m expecting others from the US, South Africa, Wales, England… who knows? It is absolutely lovely… and your idea of using the colours of the Australian State flowers is wonderful – thank you again. It is a constant source of joy… never knowing what might arrive in the post.